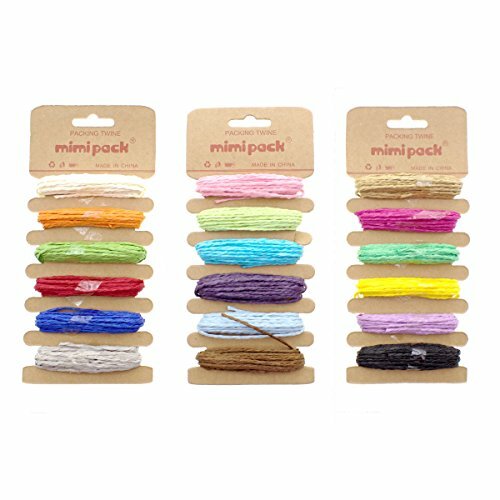 These twine are totally perfect for arts, sewing and crafts projects. These raffia twines are created from high quality materials. Unique, artsy and strong. This is also perfect for kids' projects and personalized gifts. You can be sure that these are not made of cheap material. Use them to add creativity to your clothing and crafts, to your own party and gifts for your loved ones which will truly stand out. You can also use them as gifts for your guests for any special occasion, event, or party. These unique twines can't be found anywhere else! Have a unique, special keepsake! Check out our entire line of twines! We have different sets of our twines! MULTIPURPOSE - These raffia packs are great for gardening projects, sewing projects, creating crafts, and art in scrapbooks. They also work beautifully to make a personalized gift. Use them with your clothes, crafts, or use them around as decorations for a party. DETAILS - Each wrap of our beautiful twine is 16 feet! 18 colors = 288 feet! 100% MONEY BACK GUARANTEE - 100% guarantee that you are fully satisfied with your product or receive your money back. If you have any questions about this product by Mimi Pack, contact us by completing and submitting the form below. If you are looking for a specif part number, please include it with your message.